Issue setting PYTHONPATH permanently for IDLE. Changed.bash_profile and restarted computer, but still only works in terminal. We commonly use a variety of DNA sources. Classic proteinase K followed by phenol-chloroform extraction and ethanol precipitation. Qiagen Gentra Puregene (my favorite method). Qiagen DNeasy (manual or from Qiacube). Invitrogen Purelink. Like you mentioned QC is the most important issue. Nanodrop to get the basic quality values. We expect 260/280 1.8-1.9 for RNase treated DNA (always RNase treat) and want 260/230 >1.9. Then use Qubit to get the concentration (best to dilute to ~250ng/ul) by nanodrop so sampling is accurate. 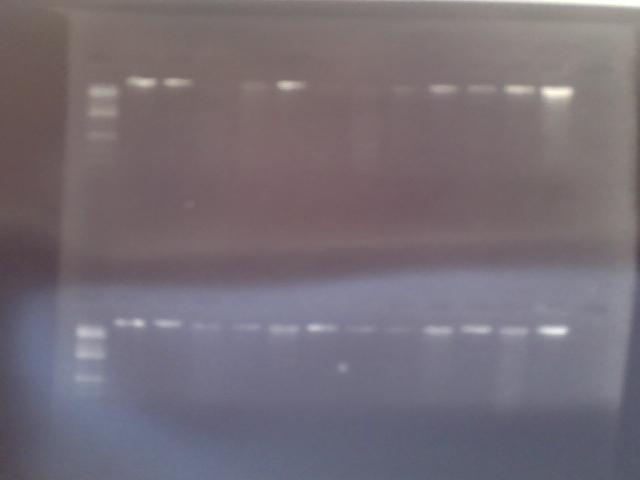 Then run ~200ng on a 0.6-0.8% gel to check the size of the DNA. You should have a nice clean single band of high molecular weight DNA above 20kb and no DNA stuck in the well. If you are only seeing 3-7% of nanodrop I’d want to ensure you have an RNA free prep and that it is not degraded. We have seen that degraded (smear on a gel) shows much lower concentration by qubit/picogreen than high molecular weight DNA at the same concentration as measured by nanodrop. DNase contamination is the obvious reason for your reduced yield. You can either increase the temp to 60oC when the Rnase will be still active but not the DNase or you can include a small concentration of EDTA which will scanvenge the divalent ions helping the DNase. To 40 uL sample volume I add 2 uL of 2 mg/mL RNase A and incubate @ 37C for 10 min. This is prior to an ethanol precipitation. RNA contamination can be removed by adding 2 microlitre of RNase A (10 mg/ml, Fermentas) to 20 microlitre of DNA dissolved in TE buffer (Tris–EDTA, pH = 8.0) and incubate for 3–4 h at 37 C.